Steel slag processing production line is a complete set of production line that mainly extracts the steel drop and iron ore. Here, this text will give you the general introduction. The steel slag is uneven-shaped blocks and mix with steel drop, iron powder and dreg. It is separated after crushing, grinding and breaking. Because the steel slag is in irregular with strong hardness, we usually use jaw crusher for the coarse crushing. If the size of coarse crushed steel slag is smaller than 10mm, it can be directly sent into ball mill for grinding, otherwise, the steel slag should be sent to the fine jaw crusher for the secondary crushing. It is impossible to smash the slag completely through crusher, and the ball mill is needed. 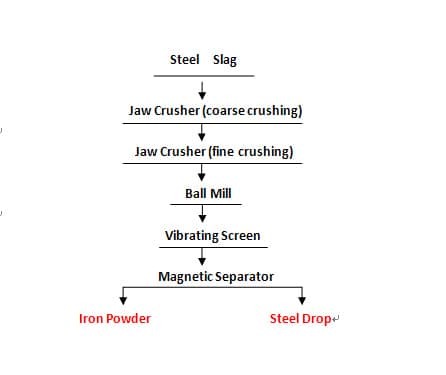 The particles of steel slag below 10mm are sent to ball mil to break the connected structure between steel slag, iron powder and dreg. Because the steel drop and iron powder are magnetic, the equipment of separation and extraction is magnetic separator.